What Does Code P2003 Mean? Diesel engines, in one way, offer better torque and fuel economy than gasoline engines. On the other hand, the fuel itself tends to produce more PM2.5 and PM10 or “soot” (particulate matter less than 2.5 µm and 10 µm in size), which is hazardous to human health and the atmosphere. Modern diesel engine technology and diesel fuel refinement has managed to eliminate much of these emissions, but there are still certain circumstances when more PM will be generated, usually when the engine isn’t running as hot, such as on short trips and in stop-and-go traffic. 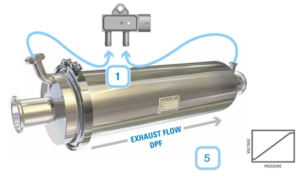 The diesel particulate filter (DPF) captures PM emissions that are generated while the vehicle is driven in low-load conditions, storing them until they can be burned off. When the vehicle is driven in high-load conditions, such as up hills or on long trips, the ECM (engine control module) will command additional fuel injection, which increases DPF temperatures to 450 °C to 600 °C (840 °F to 1,112 °F), enough to completely oxidize stored PM emissions, clearing the filter without releasing harmful PM emissions to the atmosphere. 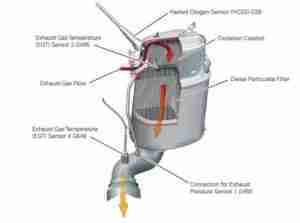 This process is called DPF regeneration or “regen” and typically occurs automatically every 250 to 500 miles. 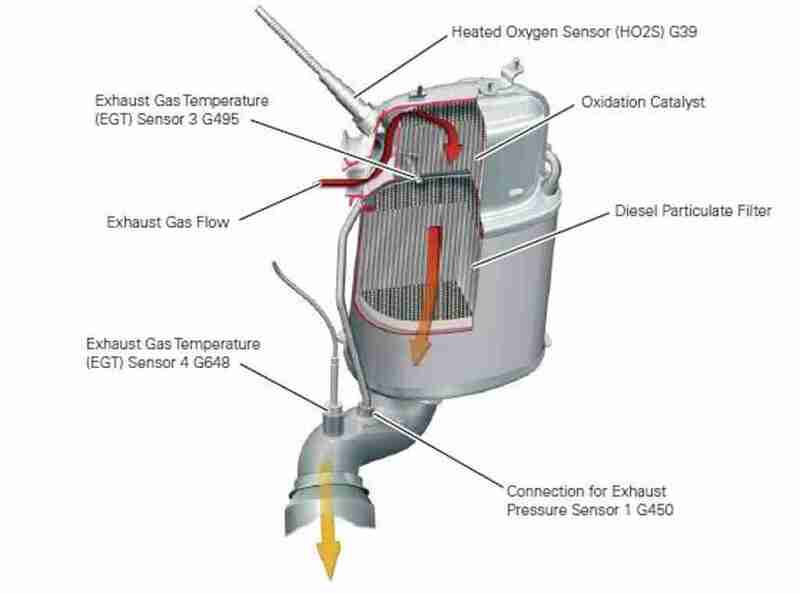 The ECM uses a differential pressure sensor (DPS) to measure the effectiveness and capacity of the DPF. Simply speaking, the DPS measures the difference in pressure before and after the DPF. A clean filter doesn’t provide much resistance to the exhaust close, and the DPS measures little to no pressure differential. As the DPF collects PM emissions, resistance to exhaust flow gradually increases, effecting a gradual increase in pressure differential. Depending on the vehicle, a certain DPS threshold may trigger a DPF regen cycle, but only if conditions are right. Some vehicles may trigger a DPF regen cycle around 15% capacity, for example. What are the common causes of code P2003? Depending on year, make, and model, DTC P2003 may have number of causes. Here are some of the most common. Driver Habit – There are plenty of drivers who simply don’t get their vehicles out on the highway often enough. All that stop-and-go traffic and those short trips end up overloading the DPF, but never gets it hot enough to run a DPF regen cycle. Usually, the solution is to manually put the vehicle into DPF regen mode with a scan tool or simply take it out on the highway for a bit. The heat will burn off PM emissions as it is meant to. Overcharged DPF – Aside from driver habit, DPF overcharging can occur because of a poorly-maintained engine or using fuels with high sulfur content. Some biodiesel blends produce more than normal amounts of soot, which may be excessive for your vehicle. Forcing a DPF regen may not resolve the problem, and replacement will be necessary. Defective DPS – Some manufacturers have released updated parts, acknowledging that the factory-installed DPS was of poor quality. One common fault was poor internal sealing on one side or the other of the sensor, which would skew pressure readings. Always check with your dealership service center to see if the part on our vehicle is the most recent version. 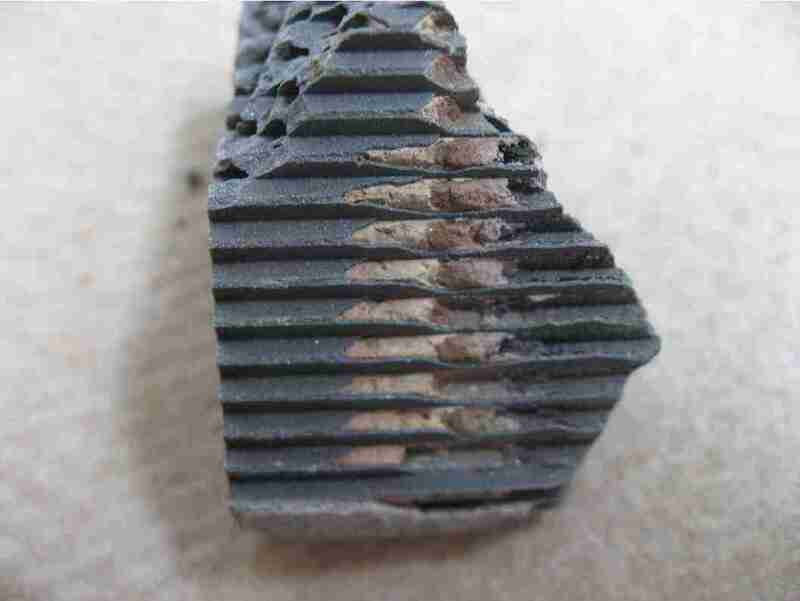 Reflash – Some manufacturers have released software updates addressing this DTC. Always check with your dealership service center to make sure your vehicle software is up to date. What are the symptoms of code P2003? Depending on the failure mode, you may not notice anything other than the MIL. Other vehicles may put the powertrain into limp-home mode, restricting engine and transmission performance. Vehicles with an overcharged DPF may experience hard starting, poor fuel economy, poor acceleration. Concurrent DTCs may also appear, such as EGR (exhaust gas recirculation), turbocharger, or fuel trim faults, even if there are no faults in these systems. How do you troubleshoot code P2003? Because this DTC describes what is pretty much a self-maintenance issue, this DTC may stay in memory even if the ECM successfully runs a DPF regen cycle. Generally, the first course of action is to clear the DTC and see if it comes back. If the DTC doesn’t return, then you can safely assume that the DPF regen cycle had run successfully, leaving nothing more than the residual DTC. If the DTC does return, here are some troubleshooting steps to help you resolve the issue. 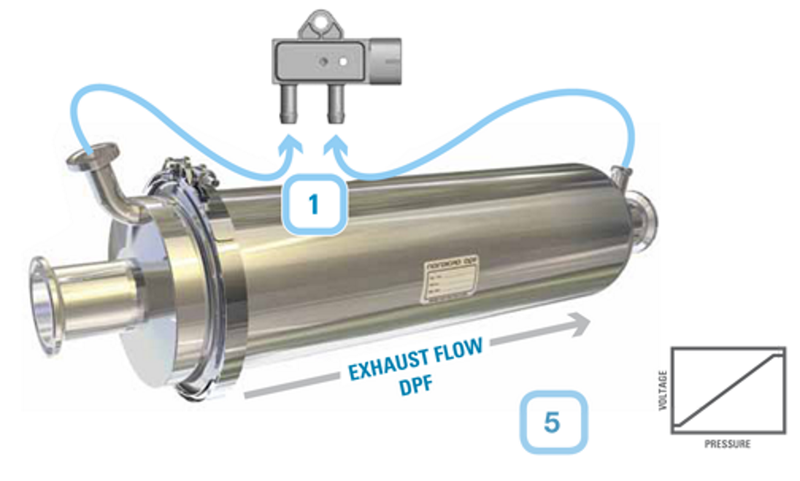 Visual Check – The DPS measures the differential in pressure between two tubes, from before and after the DPF to the DPS. If there is a leak before the DPF, such as a leaking exhaust gasket, corrosion, or damage, this will reduce pressure on the leading side of the DPF, resulting in inaccurate differential pressure readings. The ECM will be unable to properly gauge DPF efficiency and capacity, and will unlikely be able to satisfactorily complete a DPF regen cycle. If any leaks are noted, repair as necessary. Check the DPS connector and harness for bent or broken pins, corrosion, or damage. Repair as needed and ensure connector is seated properly. Manual DPF Regen – You may need to put the vehicle through its paces to force a DPF regen cycle. Some scan tools may give you access to this function. Clear the DTC and run your vehicle at highway speeds for about thirty minutes. This will put the engine in the right conditions for a DPF regen cycle, which will burn off accumulated PM emissions. Caution: Carry a fire extinguisher. Most manufacturers recommend replacing the DPF if it is charged to more than 75% capacity, which can be determined with a scan tool. Attempting to force a DPF regen on an overcharged DPF can cause overheating and possible meltdown and fire. Warning: There are technicians and shops who will remove the DPF from practically any vehicle, which eliminates DPF problems from recurring ever again. At the same time, depending on where you are, this may be highly illegal, resulting in fines for both owner and provider. None found. Ask a question about P2003.